The Future is Here, But it is Just Not Very Evenly Distributed. Digital assets are moving from an erratic early stage to mainstream adoption with new use cases and startups being launched almost on a weekly basis, a blockchain conference* in Hong Kong has heard. 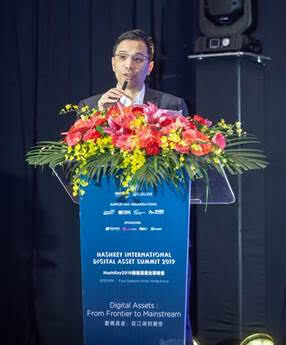 Distributed ledger technology is already powering a new paradigm shift in economics and finance and no longer merely an experiment, Michel Lee, executive president of Hong Kong-based digital asset technology firm HashKey Group, the co-organizer of the day-long conference, said. Xiao Feng, vice chairman and executive director of China Wanxiang Holdings and chairman of Wanxiang Blockchain, outlined how fintech is pushing economic development. The world is entering an era of “Fintech 3.0,” Xiao Feng said in his address, with an increasingly large number of new products are launched based on blockchain rather than legacy infrastructure. In a keynote speech entitled ‘Digital Transformation and Blockchain Application in Supply Chain Trade Finance,’ Abdul Raof Latiff, managing director at DBS, discussed how the Singaporean bank is becoming more blockchain-ready and future-facing. Hong Kong has a tremendous opportunity to leverage innovations in fintech because it has a rich talent pool and world-class infrastructure, Lee said. “As a major world financial centre, Hong Kong can be at the forefront, but as the technology goes mainstream the city cannot afford to be left behind,” said HashKey’s Lee. Other speakers and panellists included Clara Chiu, head of fintech unit and director of licensing, Securities and Futures Commission; Patricia Yeung, senior manager of Fintech, InvestHK; Paul Yuen, general counsel, Monetary Authority of Singapore (MAS); Cat Rüst, head of innovation technologies, Greater China, UBS AG; Takato Fukui, director general, Japan Virtual Currency Exchange Association and David Kwan, Head of Asia SMARTS Market Surveillance, Nasdaq. The conference was also attended by Eric Chan, chief public mission officer, Cyberport, Ken Lo, founding member of ZhongAn International, amongst others. *HashKey International Digital Asset Summit 2019, March 22, 2019, Hong Kong. HashKey Group co-hosted the summit with Wanxiang Blockchain Labs, with the support of Cyberport, DBS, FinTech Association of Hong Kong and ZhongAn International.